Pioneers in the industry, we offer decade capacitance box, decade resistance box and power project board from India. 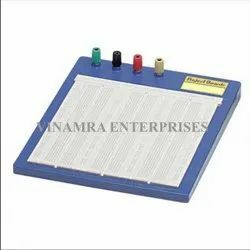 We are highly acknowledged organization in the domain, engaged in offering high quality Decade Capacitance Box. Does not require maintenance, the given range of capacitance box is provided in several specifications accordingly to the customer’s needs. 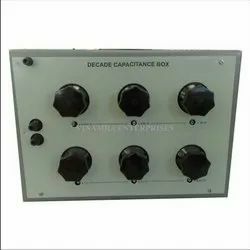 This capacitance box is designed using excellent quality material and sophisticated technology under the keen observation of our competent professionals. Our offered capacitance box is provided at very reasonable prices. Decade Resistance Box are precision Instruments intended for general laboratory use, MB and educational purposes. These are used as a multiplier, shunt, substitution resistor, or as an arm for AC or DC bridges. Power Project Board System has been designed to provide Instant circuit construction without soldering on the bread board area learners can Insert components directly on breadboard and make all interconnections as required with 24 Swg (Gauge) solid wire. Within few minutes they can completetheir projects/design on the same. Your precious IC's are not damaged hare Instantly reusable, No expensive special jumpers are required. You can insert all components directly without any adapters I.e. IC's such as types 8, 14, 16, 20 or 40 pin DIP units, 1511 and all discrete components with lead diameter upto 0.56mm (24 Swg).